A gold ring with a wide band and sliced raw diamonds. 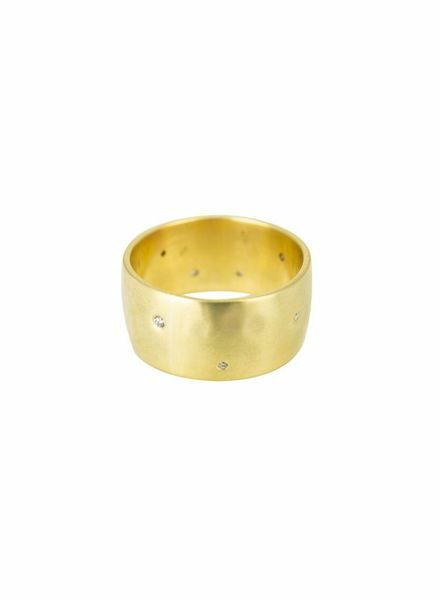 A gold band with a hammered texture with scattered diamonds. A tapered ring with 5 white diamonds. A textured gold ring with white diamonds. A multi-stone ring with sliced raw diamonds and black rutile. A raised bar ring with uncut diamonds. A geometric ring with uncut diamonds and oxidized sterling silver. A triangular ring with uncut diamonds. A tiered, triangular ring with sliced raw diamonds and pave champagne diamonds. A silver paneled ring with a set of embellished diamonds. A beach stone ring with a brass nail-head band. A naturally shed antler with a sterling silver band and diamond nail head. A set of three astrid charms with embellished diamonds.